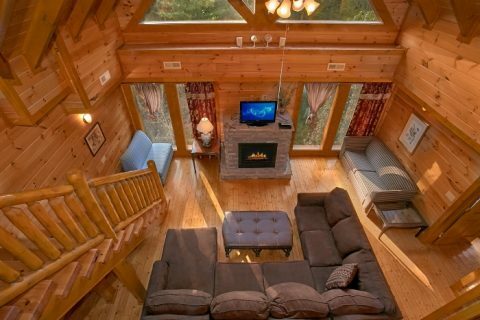 Searching for the right cabin to accommodate your large group in the Smoky Mountains? 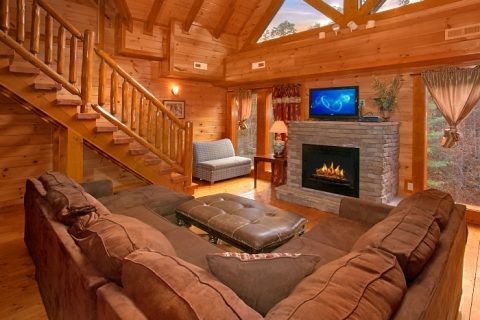 Explore "Indoor Pool Lodge" in the Black Bear Ridge Resort area! 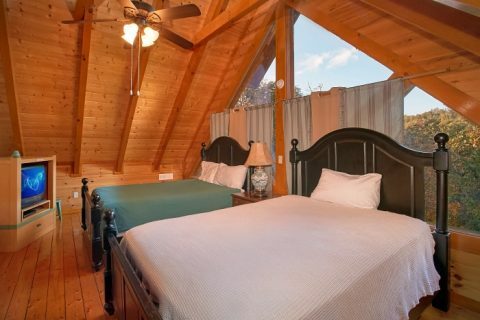 This luxury cabin lodge is only minutes away from the area's top attractions and it boasts an excellent set of amenities. 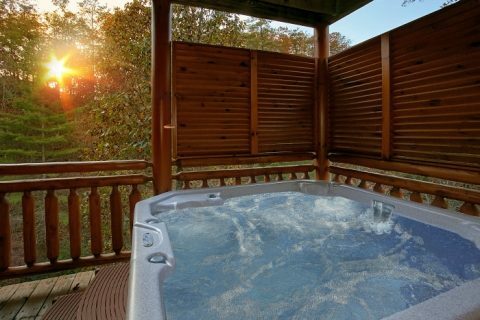 Best of all, this rental offers plenty of space for the largest groups. 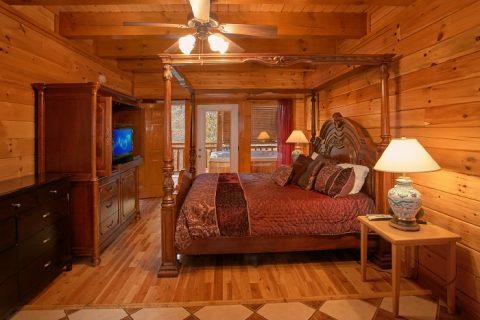 With 8 bedrooms and plenty of space to sleep 28 guests, you'll have no trouble sharing terrific vacation memories in Gatlinburg and the Great Smoky Mountains. 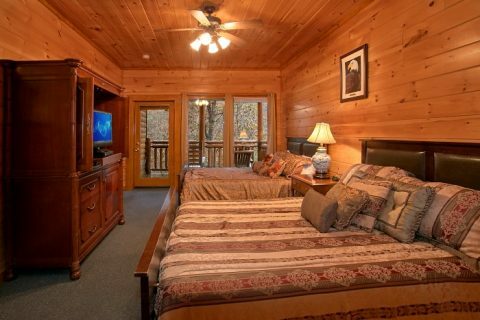 One of this cabin's finest features is the large, 14 Ft by 18 Ft swimming pool on the lowest floor of this rental. This enclosed swimming area offers year-round swimming no matter the season, so be sure to pack a swimsuit to enjoy this excellent amenity! 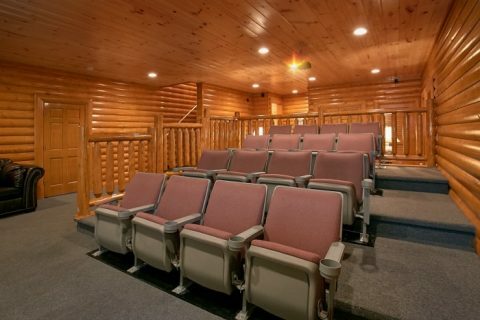 Above the pool, you'll find a fully-equipped theater room with 24 theater-style seats, a 9 Ft screen, and a Blu-Ray DVD player. 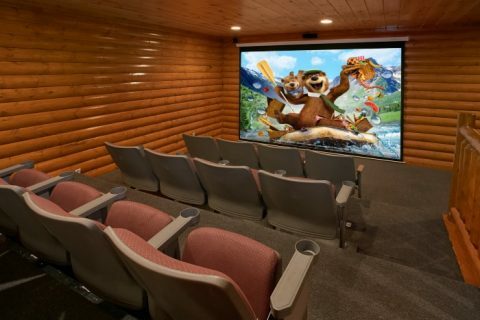 This area is perfect for gathering with everyone to watch a terrific movie during your stay. In the main living area, you'll find a great place for gathering together with the people who matter most. 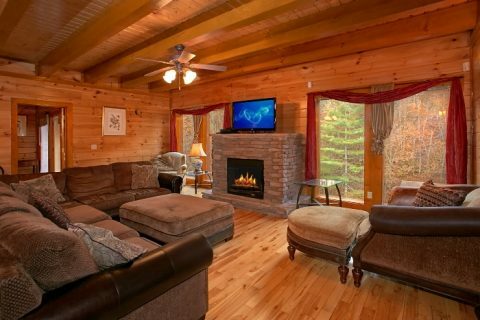 Relax on comfortable furnishings while you stay warm next to the electric fireplace. 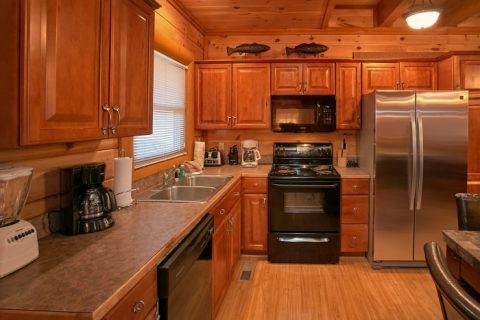 This level also houses your cabin's full kitchen with all the basics you need to keep your group happy and full. 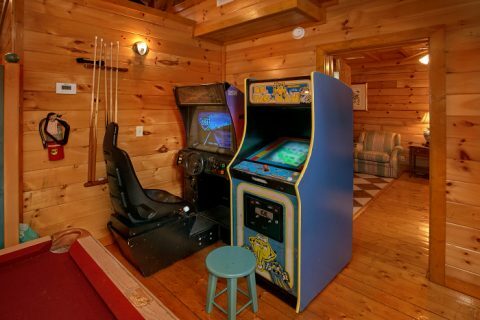 Upstairs, you'll find another living room area complete with a pool table and two arcade games. 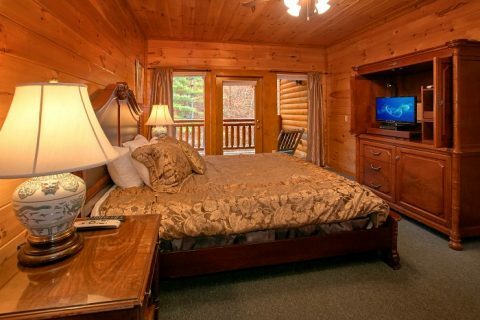 After a long day of exploring the mountains, there's no doubt your group will appreciate getting some rest in this spacious cabin with plenty of private bedrooms. 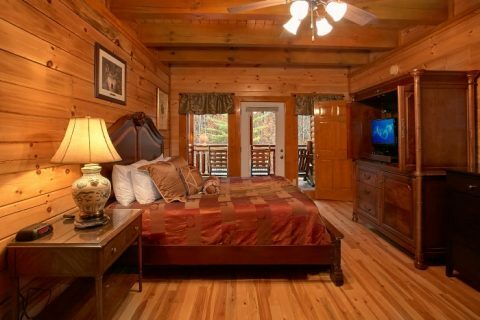 The main floor is home to two king-size bedrooms that each offer flat-screen televisions, jetted tubs, and full bathrooms. 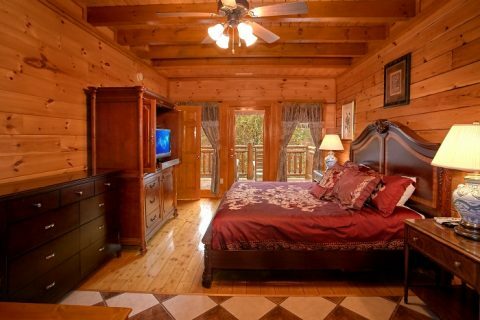 These rooms also have access to private decks, one with rocking chairs and the other with a year-round hot tub. 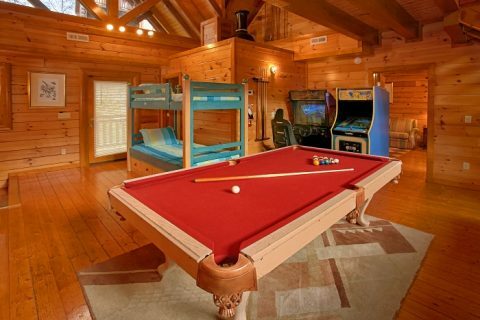 On the 2nd level, there are two more sleeper sofas and a twin bunk bed. This floor is also home to two private bedrooms that both boast king beds, televisions, in-room jacuzzi tubs, full baths, and private decks. 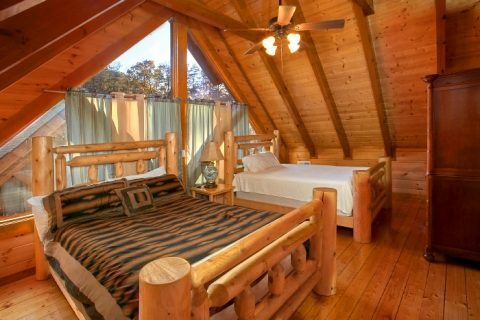 On the top floor, there are two more bedrooms that each offers two queen-size beds. 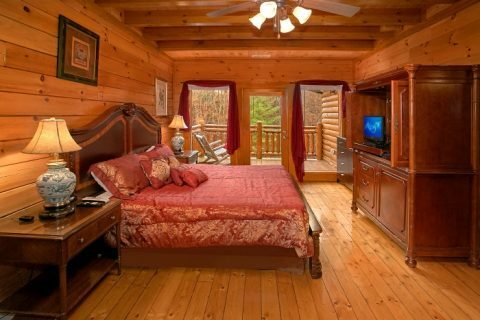 Lastly, the floor with the theater room also boasts two more bedrooms: one with a king-size bed and another with 2 queen-size beds. 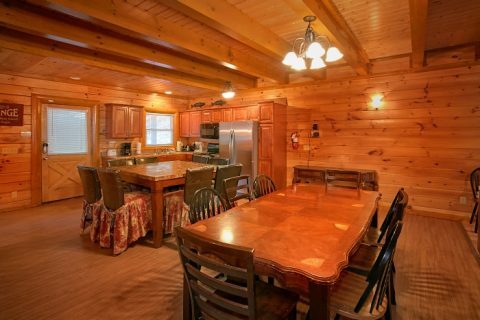 With comfortable amenities and plenty of space for your guests, this luxury lodge in Black Bear Ridge Resort is bound to take your group vacation to the next level! 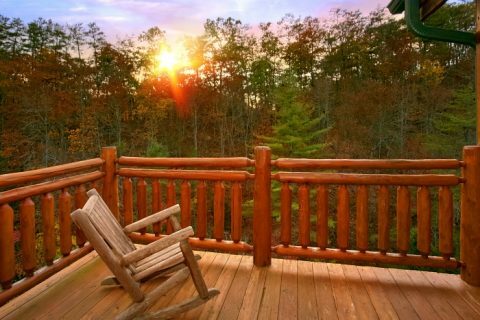 Better yet, you can save your vacation dollars by booking this cabin with a special online discount! 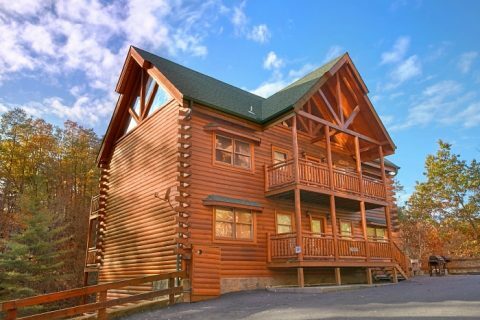 Book today with Cabins USA Gatlinburg and save on your large cabin with 8 bedrooms!